Set in the real street, almost unchanged, and indeed the real Alan Bennett home where the story took place, it was always going to take a community effort to render Lady in the Van on the big screen. The film opens today. Take a look at the trailer here. 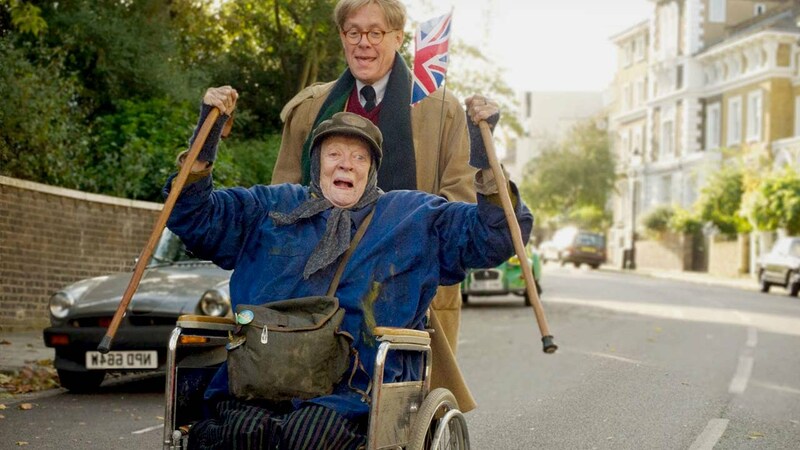 Starring Maggie Smith, the film tells the true story about an eccentric woman called Mary Shepherd who lived in a battered van on the driveway of the writer Alan Bennett for 15 years. On-set in Gloucester Crescent, almost every day, during the shoot in autumn last year, Alan Bennett chatted to the neighbours he first befriended decades ago. It’s a neighbourhood where those who were children when the real Miss Mary Shepherd lived there, have grown up and are now in their own homes on the street. The film represents their personal history. Location Manager Helene Lenszner says the value of residents’ support to make a well-loved but small budget movie such as this, cannot be underplayed. “It couldn’t have happened without the goodwill and co-operation of the residents of Gloucester Crescent and Inverness Street,” she says. “We were so fortunate to film on the street, and in the house, where much of this story took place. “Alan Bennett still owns the property and it has barely been touched over the years. He knows many of the residents and a number of families who remember Miss Shepherd (some of whom are portrayed in the story) still live in the crescent as do some of their now adult children. Visits to the set for some children from the local school were fitted especially into the schedule, as well. The interest was such that a private screening for residents had to be held over two nights to accommodate everyone. A local flat was converted into Maggie Smith’s green room for the shoot and another neighbour rented the production an ex-restaurant for equipment storage. Residents agreed that a donation to a local homelessness charity was the most appropriate token of thanks from the production. Donations were also made to a local school and the Primrose Hill Residents Association, despite the tight budget. “Gloucester Crescent has changed remarkably little over the years in terms of house frontages, lamp-posts etc., but this was a period drama, set in the Sixties and Seventies,” Ms Lenszner says. “So we needed to clear the streets of modern vehicles every day – on and off – for a total of five weeks. “There was a degree of trust and goodwill that meant many people in the street would give their car keys to two dedicated people on our security team – allowing them to move up 30 cars a day to accommodate the various sequences we needed to film. “Even with a pre-arranged traffic management and sometimes complex pre-arranged parking plan in place, some days the cameraman would look through the lens, amend a shot or direction and realise one or more vehicles would be in view – so the flexibility of residents was essential to us. Everyone pitched in to help. She explains that well before filming began, the production invited all residents to a meeting above a local pub. Producer Kevin Loader outlined the plans, and very quickly, most residents made it clear that they wanted to talk about parking and traffic management. Ms Lenszner continues, “We knocked on every door over a period or a couple of weeks and spoke to as many people as possible, acquiring contact details from whoever was interested and willing in engaging with the project. We then sent out weekly emails from a couple of weeks before commencement of filming explaining the schedule and how the parking, traffic management and security plan would work. “We encouraged residents to inform us about expected deliveries (shopping and babies! ), building works, school-bus pick-ups etc., to ensure we accommodated normal life and special requirements as much as possible. “As often as possible, we would wait until the school run was over in the mornings and then start moving cars out of shot, replacing some of them in the evenings if required. “Residents had the option of moving their vehicles the evening before or in the mornings or allowing us to do this for them. Quite amazingly, people really did put themselves out to assist us and it was a truly collaborative effort. “As I’m sure you would find on any street, there was a heavily pregnant resident, some with young children, some disabled adults and children and it’s essential for crews and productions to remember that ‘real’ life comes first and ensure we accommodate everyone’s requirements to the best of our ability. “One of the critical elements was a fantastic security team (ATL) who the residents trusted and got to know quite well, even asking if they could employ them at weekends thereafter! They were cold and wet and absolutely ‘on it’, all day, every day and they did a great job. “In fact, some residents said they loved having their neighbourhood to themselves again. It’s a quite a lively part of London but during the shoot the area became very peaceful in the evenings. Although most the action takes place on Gloucester Crescent in Camden, scenes were also filmed in Inverness Street market. Also, Cecil Sharp House, where Miss Shepherd is playing the piano and a nun slams the piano lid on her fingers. Some interiors were shot at St Silas Church and along Regents Park Road, Miss Shepherd goes into a grocery store. She also walks along the pavement from Primrose Hill Park past The Queen pub and knocks on the window of the cafe where Alan is having lunch with a distinguished friend. Scenes were also shot around the National Theatre in Lambeth and from Waterloo Bridge. In Haringey, a piano recital and its audience were filmed at St Augustine’s church hall.